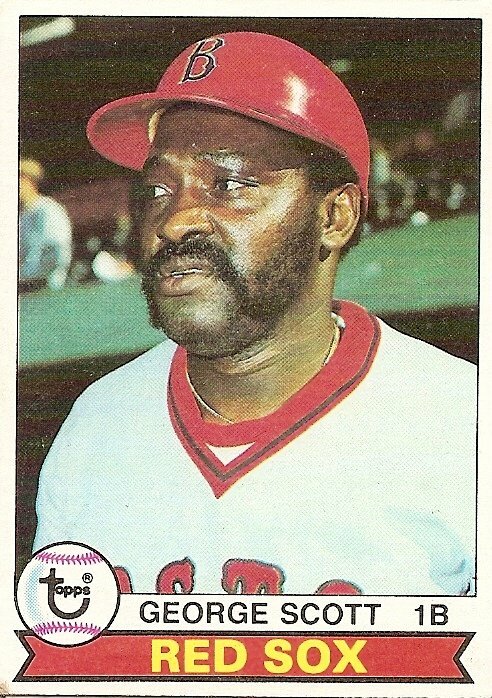 George Scott’s name has come up a lot this year in Boston during celebrations of the 40th anniversary of the 1967 Red Sox, but for me he will always be the free-swinging, tater-blasting centerpiece of a team that fell just short of the pennant ten years after the “Impossible Dream.” Today on Cardboard Gods, guest writer Jon Daly celebrates that incomparably entertaining 1977 Red Sox team. Daly, known here and on The Baseball Think Factory as Ennui Willie Keeler, has published biographies at the Society for American Baseball Research’s Baseball Biography Project on Tacks Latimer and Jim Willoughby. 1977 was a watershed year of baseball for me. It was the first time I played in an organized league. I was on the Vikings in the Farm League in Ellington, Connecticut. Farm League was for nine year olds and ten to twelve year olds who weren’t playing in Little League. We went 10-0, no thanks to me. I got two hits all year both in the first game. One was a well-stroked liner that I pulled to right field. I rounded first and took second. The throw was way offline, so I was able to wind up on third. Later that night, I hit a popup that died in no man’s land somewhere in short center. The rest of the year, like a lot of kids. I was the master of two true outcomes. I either walked or struck out. I played leftfield mainly, but hitting was more fun for me, even with my limited success. Like the Minnesota Vikings, we had parties, but they didn’t involve pillaging on a boat (a rather apropos celebration for a band of vikings, no?). We’d go to Moser’s Dairy farm for ice cream or some pizza joint across the street from there. I remember one teammate playing KC and the Sunshine band on the jukebox and another playing Ricki Lee Jones’s “Chuck E.’s In Love.” It was a good time with a good set of fathers coaching us. They were better than my next coach on the Cardinals, a chain-smoking Walter Matthau wannabe who taught me more four-letter words than I would’ve learned on a tour of duty with the Seventh Fleet. But I’m not here to talk about the Ellington Farm League. I’m here to talk about one of the more underrated pennant races in my living memory. The 1977 AL race that year may have been just as good as the one in ’78, if not better. Now, I could crunch some numbers, but that really isn’t my forte. I’d probably come across as a third-rate Bill James in a bus station. As it is, this may be weak Simmonsesque drivel, but it’s a lot easier to write. Japanese baseball guru Jim Albright came up with a formula to rate baseball pennant races. It takes into consideration the records of the contenders and how far apart they are at the end of the season. The AL East that year had three contenders that finished over .600. And the race lasted until the last Saturday as the Red Sox and Orioles finished each other off and the Yankees won the crown. It was the first real year of the Free Agent Era. The Yankees signed Reggie Jackson and Don Gullet in the offseason. The Red Sox countered by signing reliever Bill “Soup” Campbell, a Vietnam vet that the Minnesota Twins found a few years back in some factory league. As a kid, this blew my mind. I was still under the impression that the world was pretty much a steady-state world. North central Connecticut is pretty much equidistant between New York and Boston, so we got to hear a lot about the Red Sox and Yankees, and read about them in the Hartford Courant and Journal Inquirer. There was a smattering of news about the Mets, but their Big Story that year was off the field when they traded Tom Seaver to the Reds. They were barely on my radar screen (and wouldn’t be until a few years later when I started hanging out with The Wig and Admiral Will). I grew up in a Red Sox family in a Yankees neighborhood. It was like Alsace-Lorraine in a sense. Reggie. I was sick of the other kids in the neighborhood like Skeeter talking about him all the time. I dunno, maybe my perceptions were colored by the media, but he was probably the first or second player that I didn’t like. The other one who vied for that honor was Graig Nettles, thanks to a fight against the Red Sox in ’76. The one where Bill Lee separated his shoulder. I didn’t care for the rest of the Yankees (except Lou Piniella for some reason) but I really didn’t like Jackson or Nettles. That Red Sox team was sometimes called the Crunch Bunch. They hit a ton of home runs for a team from the 1970s. Now this has nothing to do with nothing, but that ’77 O’s team was the one that Eddie Murray and Brooks Robinson played together on. That’s 42 years of baseball history right there. The teams were ably skippered by their three managers. Don Zimmer was having a good year, and I think he’s underrated. One of these days I’ll get into more detail about this (he had Mario Mendoza as his starting shortstop one year and the Rangers still had a winning record!). Billy Martin managed to stay gainfully employed the whole year. Son of Sam didn’t get to him. Neither did the looters during the great blackout that year. And Earl Weaver, well, he may be the best manger I remember (although La Russa and Howser may have overtaken him by now. But neither of them had a perm like Earl’s). What is Daly doddering about? I’m doddering about this game. It was the last Saturday of the season and the Orioles (eliminated by the Red Sox the day before) paid the Red Sox back and eliminated them. I still remember that ninth inning. I was in my grandparents’ living room watching it. The Sox were down three and Bernie Carbo hit a clutch two run homer, plating Fred Lynn. I think that there was a Marlboro billboard in Fenway near where the ball went. There was still hope for a few minutes, until the game ended on a Jim Rice fly ball to center. I cried. I really expected the Red Sox to come back and win the game and make the playoffs somehow that year. But it wasn’t meant to be. I’m pretty sure that was the last time that I cried tears of sorrow over a sporting event. After that, 1978 wasn’t as disappointing. I was numb by 1986. They were supposed to finish the season on Sunday, but it rained. It was just as well. You are currently browsing the archives for the George Scott category.